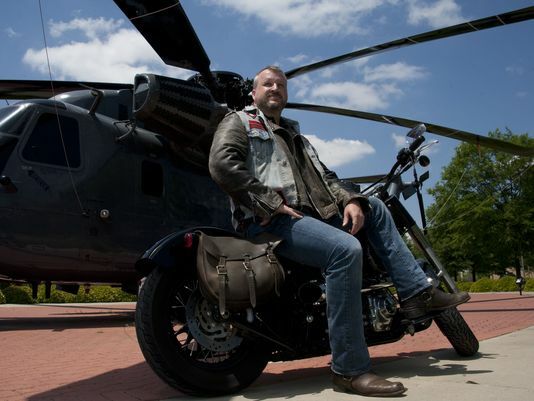 William Dulaney, a professor at the Air Force Command and Staff College, poses on his Harley in front of an HH-53 Super Jolly Green Giant static display at Maxwell Air Force Base. Army officials in Colorado say they're considering placing the Iron Order — one of the fastest-growing motorcycle clubs in the country, and particularly popular among military and law enforcement personnel — on an off-limits list of extremist groups and criminal gangs in the wake of a deadly biker brawl in Denver. “After what happened this weekend, it is definitely under review,” said Lt. Col. Jason Brown, a spokesman for Fort Carson’s 4th Infantry Division. One man was killed and several others critically injured when dozens of bikers from the Iron Order and Mongol motorcycle clubs collided in a gun and knife fight at a Saturday swap meet in downtown Denver last Saturday. About half of the Iron Order bikers involved in the brawl were military veterans from the Colorado area, according to a top leader in the club. The Mongols are among about seven dominant “Outlaw” motorcycle clubs, also known as “1-Percenters” in the biker world and recognizable by the three-piece patches they wear. Self-described as the “baddest 1%er motorcycle club known worldwide” — the Mongols have long had a reputation as one of the most violent gangs in the country and are considered off limits to military personnel by most commands. The Iron Order is a relative newcomer, started in 2004 by a former Secret Service agent, but growing rapidly. One expert told Military Times the law enforcement-heavy Iron Order has a reputation for starting a fight then being the first to call police. The club's attorney, however, says members of the charitable organization don't want any trouble because they have important careers on the line. Both the attorney and a report by federal investigators say violence often stems from the Iron Order's choice to wear a certain style of patch. Fort Carson officials say the Iron Order is not on the post’s list of off-limits groups but could be soon as part of the command’s regular assessments with local law enforcement leaders. “I can guarantee it will be part of that conversation,” Brown said. The off-limits list, part of a May 2015 memo to troops signed by Maj. Gen. Ryan F. Gonsalves, states that soldiers will not actively advocate, associate with or participate in groups that advance, encourage or advocate the use of force, violence or criminal activity to include outlaw motorcycle gangs. In the meantime, Brown suggested troops steer clear of involvement in the Iron Order. “In light of the events of this weekend, I would advise them to hold off until we can review this policy letter and take a look at Iron Order, look at their charter, and see what they’re about and see if there’s a pattern,” Brown said. Officials at neighboring Peterson Air Force Base were unable to say whether Iron Order is among no-go groups for airmen there and referred questions about Iron Order to the Air Force Office of Special Investigations. “OSI educates the military populace on the criminal threats, which includes but is not limited to motorcycle gang activities and their attempts to recruit military members,” said OSI spokeswoman Linda Card in a statement. She did not respond to whether OSI considered Iron Order a gang or whether it had any concerns about the group. Colorado isn’t the only place where officials are trying to come to grips with the Iron Order. Naval Air Weapons Station China Lake, California, for example, is among commands that put Iron Order in the bucket of “known supremacist, extremist, and criminal gangs” and bar anyone wearing their colors from the base. Marine Corps officials at nearby Camp Pendleton, however, say Iron Order is not on an off-limits list or flagged by leaders there as a concern. The Denver melee began when a recent Army veteran — an African-American Iron Order member in his late 20s — was taunted with racial slurs by members of the Mongols Motorcycle Club, according to John C. Whitfield, an attorney for the Iron Order, as well as chairman of the group’s legal division and a riding member since 2008. Whitfield said about 16 Iron Order members were present at the Colorado Motorcycle Expo, an annual swap meet in downtown Denver’s National Western Complex. Denver police say as many as 80 Mongols were at the meet. A few Iron Order members were grabbing a beer when the incident erupted. Denver police confirm that multiple people apparently fired weapons. Whitfield says other Iron Order members arrived on the scene and that gunfire was exchanged. By the time the smoke cleared, one Mongol rider, 46-year-old Victor Mendoza, lay dead. Three other bikers were wounded by gunfire, another suffered critical stab wounds, and three others were also hurt, according to Denver police. Officials did not say how many from each side were injured. A lawyer for the Mongols, however, insists the Iron Order members were spoiling for a fight and drew first blood. 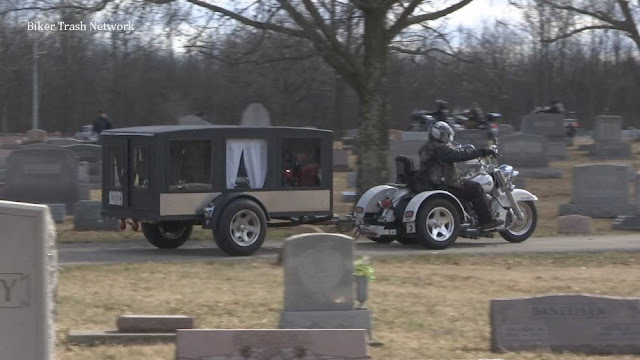 He said a picture shows the Iron Order members leaving. The Colorado Department of Corrections says officer Derrick Duran, a member of the Iron Order, is on paid administrative leave pending the results of the investigation. Denver Police officials said late Thursday that they’re still trying to piece together what happened and that so far no one had been charged in the incident. Problems between biker groups, of course, are nothing new. But officials are becoming increasingly concerned about troops’ involvement in them. In a 40-page Bureau of Alcohol, Tobacco, Firearms and Explosives internal report obtained by Military Times, officials outline a trend among current and former military personnel in what ATF calls “outlaw motorcycle gangs” or OMGs. The July 2014 report is dubbed “OMGs and the Military” and issued by the agency’s Office of Strategic Intelligence and Information in cooperation with scores of state and federal law enforcement agencies and military commands. OMGs “continue to court active-duty military personnel and government workers, both civilians and contractors, for their knowledge, reliable income, tactical skills and dedication to a cause,” according to the report. Meanwhile, Iron Order’s rapid growth has gotten ATF's attention as well. ATF officials did not respond to a request for an updated assessment on the Iron Order. Dr. William Dulaney is not surprised to hear the Iron Order is in the middle of another mess. “Wherever the Iron Order pops up, trouble soon follows,” Dulaney said in an interview with Military Times. He should know. Instead, the Iron Order acts more like thugs, he says. His advice to troops interested in joining a motorcycle club: Avoid the Iron Order. Members of the Iron Order Ohio & cheerleaders for the Marion Blue Racers prepare to make their entrance into the arena prior to the Blue Racers vs St. Louis Attack football game on Saturday, April 18, 2015. Indeed, he insists the club is staunchly law-abiding and trains all new members on rendering proper respect when it comes to other clubs. He says the group is 501(c)(7) tax-exempt organization that is heavily committed to charitable causes and is a good fit for those in and out of the military. Whitfield says he estimates about 25 percent of Iron Order is current or former military with about another 15 percent in law enforcement. He refuses, however, to provide any hard numbers of the Iron Order's overall membership. “It’s not something we give out ... we’ve decided we want to keep that private,” he says. How does that square with the club’s open and law-abiding stance? “You’ve got to remember when you tweak and lift certain protocols and certain pageantries from some of these 1 percent clubs — just wearing a three-piece patch — just by virtue of doing that you get some of these clubs that don’t like you. And they believe that they can poke you, they believe they can start things, they believe they can start an altercation just like they did down in Denver,” Whitfield says. The Iron Order’s website, however, lists more than 300 chapters across all 50 states and the District of Columbia, most with links to their own websites. Plus, there are another 20 international chapters in 11 countries, including several in U.S. military hubs in Germany, South Korea and the U.K. The group’s website also touts a special “Patriot Chapter” for active-duty troops. Whitfield says the rapid growth of the Iron Order has led to some problems, but only in provoking jealousy and attacks from other clubs. “The bigger you get, exponentially the more potential you’re going have for problems like this. This is starting to be something we have to be cognizant of. You can’t grow at the rate we’re going and not expect some issues." To date, he says, those issues have always been a case of Iron Order members being targeted and defending against other clubs, never a matter of having their own bad apples.